Plants bright red, slender, epiphytic, comprising prostrate creeping axes and upright axes; branching sparse below and more prolific distally, pseudodichotomous, laterals growing almost as strongly as main axis. Segments with 7-10 (usually 9 ) pericentral cells, about 1.5 times as long as broad, uncorticated; particularly in sterile parts somewhat twisted. 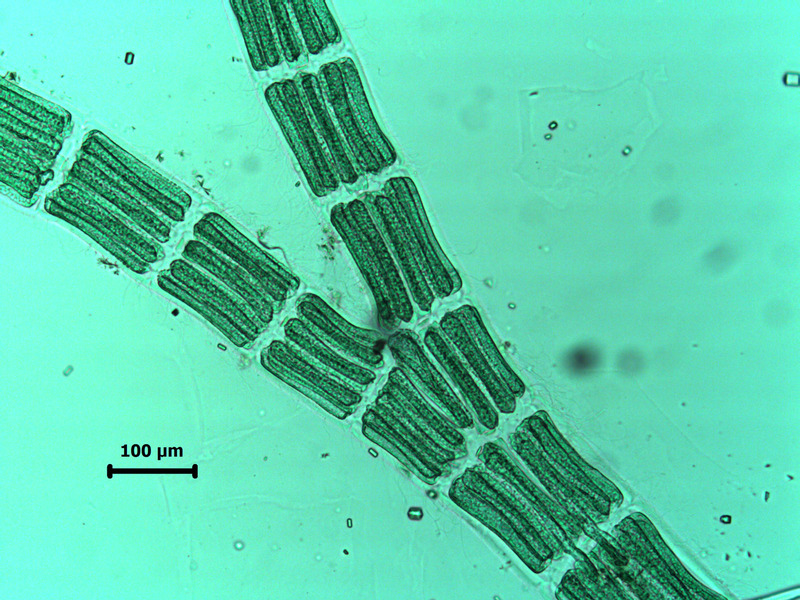 Tetrasporangia about 70 µm in diameter, in fertile tufts of branches at ends of free axes, one per segment, in rectilinear series. Antheridial stands broadly sickle-shaped, borne on tufts of branchlets near ends of free axes. 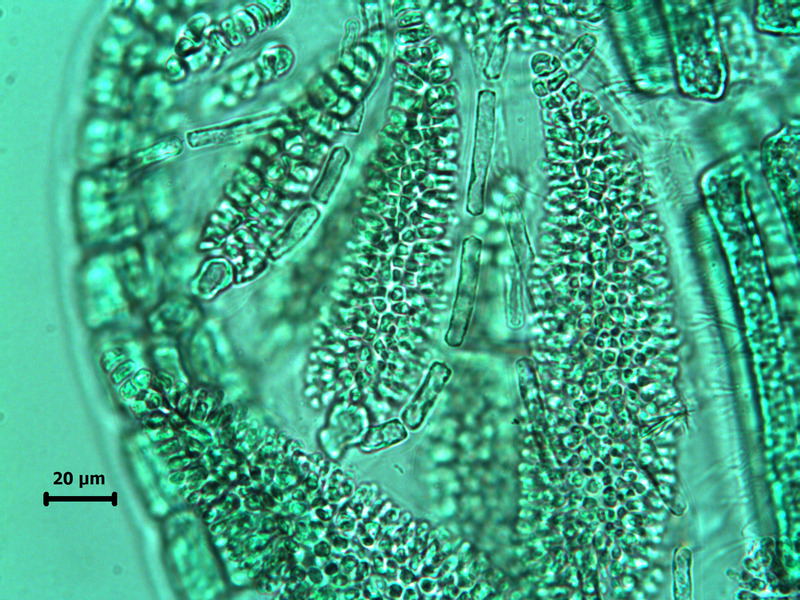 Cystocarps globular, stalked, usually borne adaxially, up to 300 µm in diameter. Recorded from Keurboomstrand to Cove Rock near East London (31-41). Epiphytic on other red algae (e.g. Rhodomelopsis africana, Tayloriella, Pterosiphonia), usually in sand-washed localities , in rock pools of lower eulittoral zone. Type locality: Cove Rock, near East London (Pocock 1953). 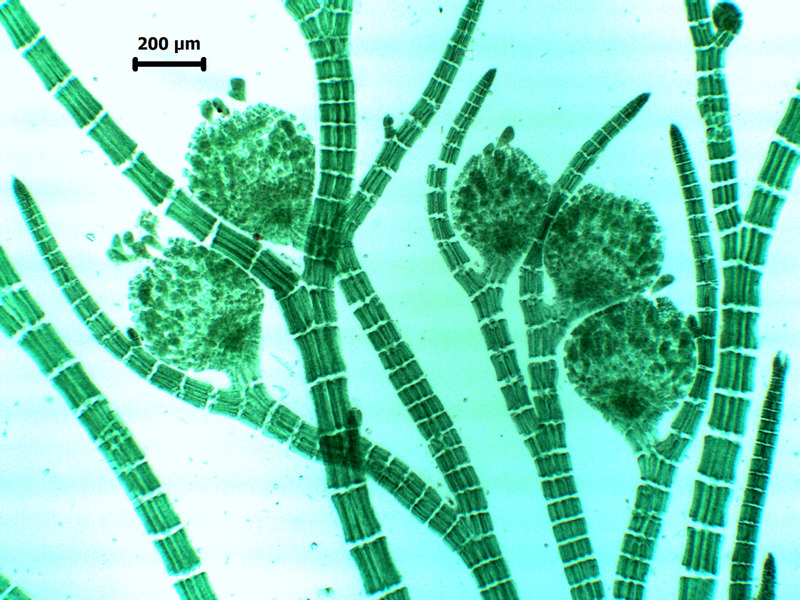 Note: Pocock (1953) points out that the fine red, hair-like branches of this species are characteristically visible as waving in the water a few cm above the host thallus. 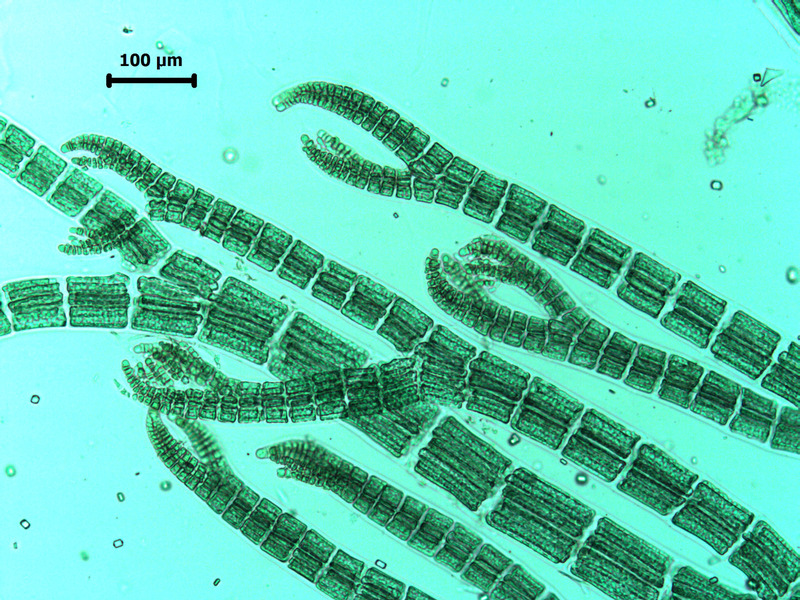 Streblocladia tenuissima, apices of axes (Keurboomstrand specimen – stained slide). 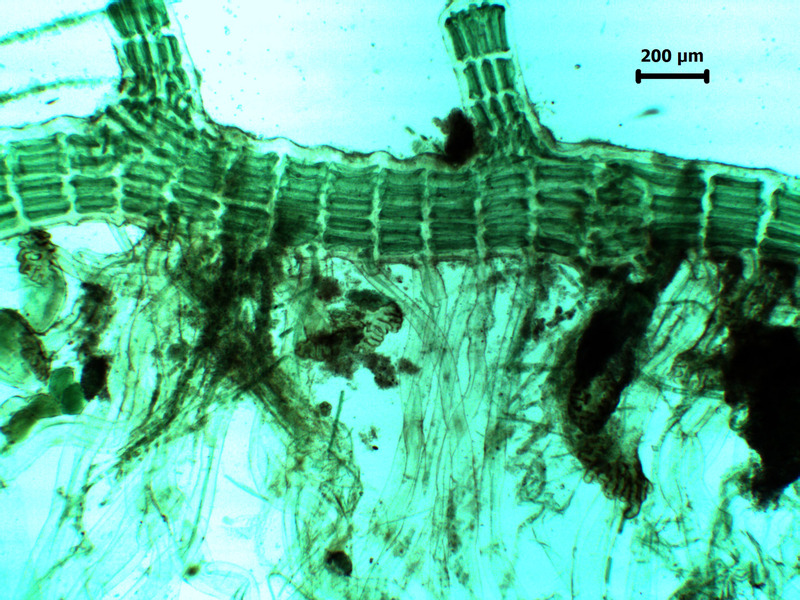 Streblocladia tenuissima, branch junction showing pericentral cells (stained slide). 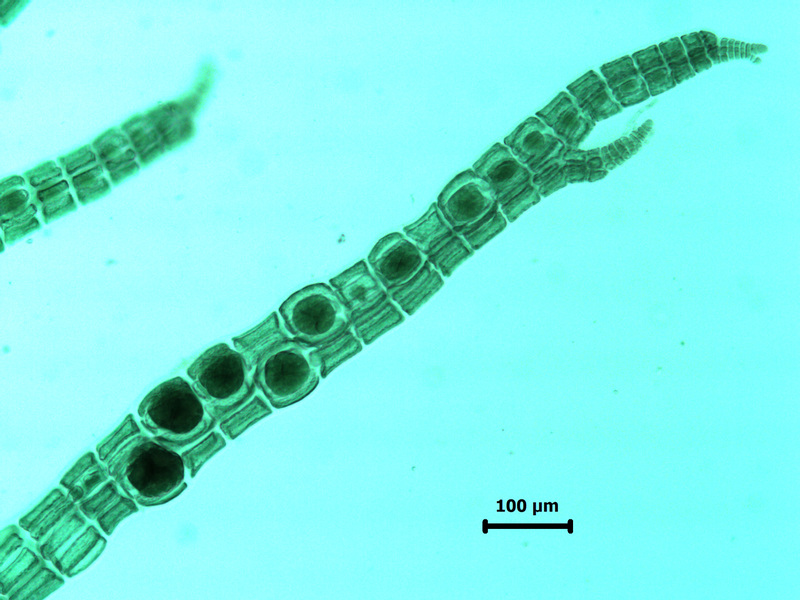 Streblocladia tenuissima, rhizoids (often two per segment) (stained slide). Streblocladia tenuissima, tetrasporangia (stained slide). Streblocladia tenuissima, male heads (antheridial stands) (stained slide). 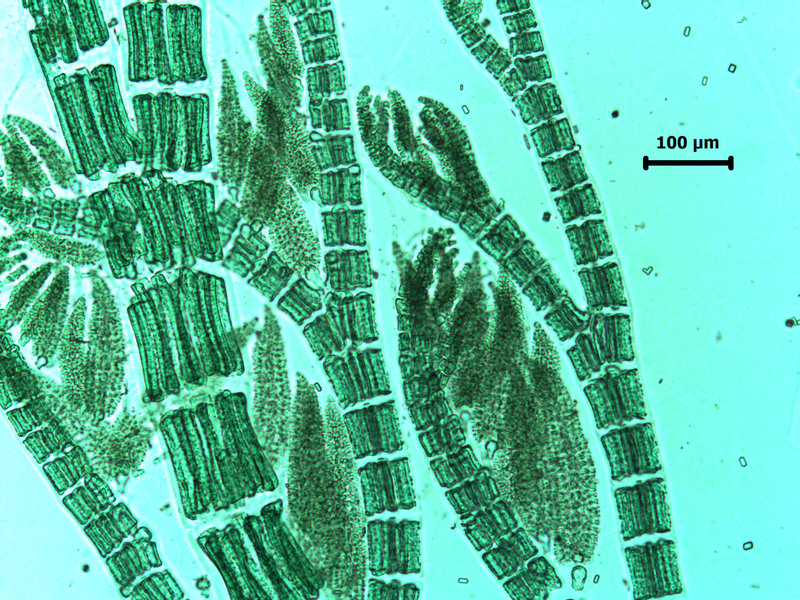 Streblocladia tenuissima, showing antheridia on forked heads with trichoblasts (stained slide). Streblocladia tenuissima, cystocarps (stained slide). 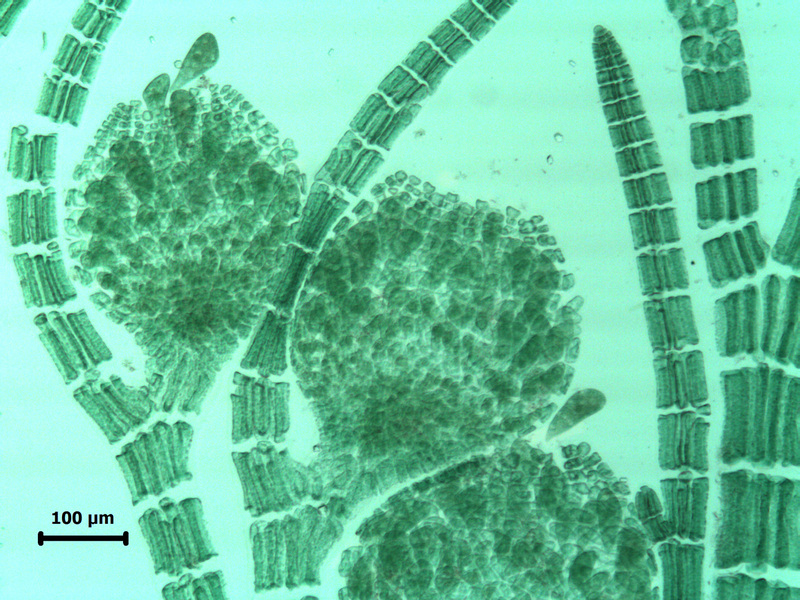 Streblocladia tenuissima, detail of cystocarps and stalks (stained slide). Pocock, M.A. 1953. South African parasitic Florideae and their hosts. 1. Four members of the Rhodomelaceae which act as hosts for parasitic Florideae. Journal of the Linnean Society of London, Botany 55: 34-47, 9 figs, Plates 5-9.